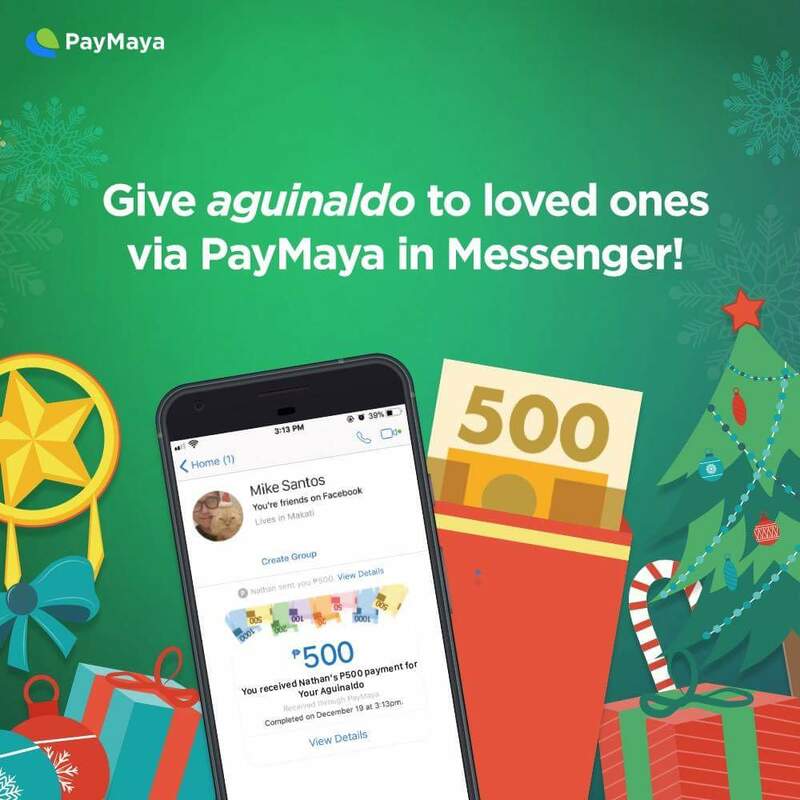 Sending “aguinaldo” or Christmas cash gifts to family and godchildren is now easier than ever as pioneering digital financial services company PayMaya today announced the launch of a “digital aguinaldo” service in Messenger, in partnership with Facebook. “Ninongs” and “Ninangs” can no longer hide from their godchildren during this gifting season, as the usual Christmas joke goes, because all it takes to send money gifts to their “inaanak” is a simple tap on their smartphones. A time-honored tradition, giving “aguinaldo” to young family members and godchildren is one of the unique ways Filipinos are celebrating Christmas, but the usual way of doing it is by handing out paper bills—usually freshly-printed ones withdrawn from the bank that still emit a distinct smell. 2. Once the account is linked to Messenger, they can upgrade their accounts to use the ‘Send Aguinaldo’ feature and load up their accounts via the more than 15,000 top-up partners that PayMaya has nationwide. 3. To send an ‘aguinaldo’, simply chat with @PayMayaOfficial in Messenger, click the “Promos & Gifts” tab, and click the “Send Aguinaldo” option. 4. Choose which Facebook friend to send the ‘aguinaldo’ to, enter the amount of money to be sent, and swipe right or left to choose the perfect design to go along with the money gift. 5. After tapping the “Pay” button, the user will be asked to enter their Facebook password, after which the money will be sent to the recipient.